This guide to warm ups is a combination of lots of resources I have. More detailed descriptions for various exercises can be found in the resources listed at the end. A warm up is an activity that prepares the student for their riding lesson by warming up both their upper and lower body and introducing movements that will be used later in the lesson. do exercises at the walk as much as possible, so the student gets the benefit of the horse’s movement. If they’re initially timid, do it at the halt then progress to the walk to build confidence. remind students to keep breathing! and breathe deep! exercise balls help the rider learn stability and lets you isolate one appendage/movement at a time without the added movement from being on a horse – works great for teaching independent hands! soft eyes – look straight ahead and relax your gaze being more aware of your peripheral vision than what’s right in front of you. instructor can stand in front of student and walk in a circle around them, asking the rider to tell them when they disappear and when they see them again in the corner of their eyes. This helps develop arena awareness by learning to see what’s going on in the arena even when you’re not looking right at it. breath through your belly – like an accordion or balloon, not through your chest. 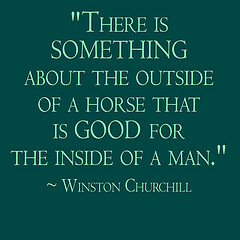 Notice that your horse probably relaxes and breathes deeper, too. You can use this exercise when your horse gets scared. play Simon Says, or Santa Says, or Pilgrim Says, or Easter Bunny Says, or Pony Says, etc. balanced posting trot – stay up 2 beats, down 1 – really helps to stabilize that lower leg and find your center of balance! 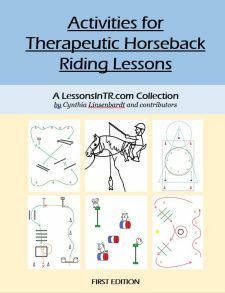 Games and Activities for Building Riding Skills in a Therapeutic Riding Setting, by Colorado Therapeutic Riding Center, Inc. Centered Riding by Sally Swift – get this book! it has great imagery and will help you yourself become a better rider too! Are there any exercises you with your students that aren’t listed here? Please let me know or leave a comment!